“I think most of us had thought a while back that 50 per cent by 2030 would be a pretty massive task for the industry to scale-up to meet,” Mr Edis said. 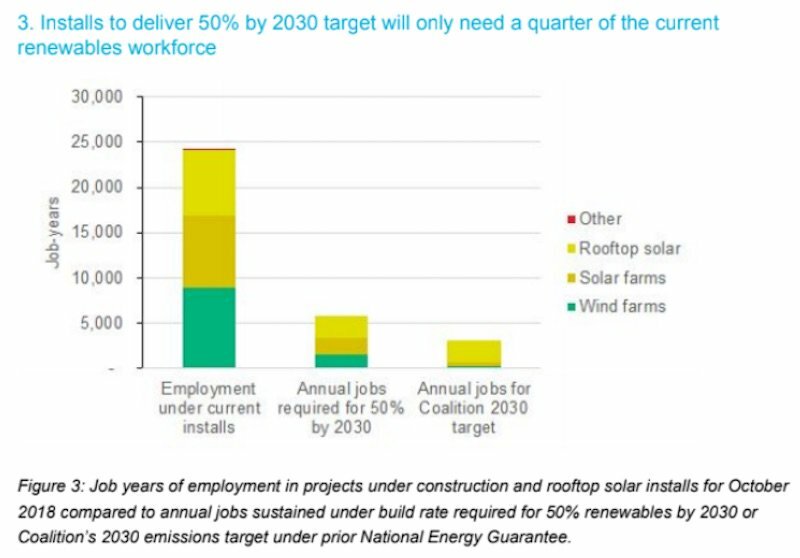 “But given the spectacular level of construction and rooftop solar installation activity since 2017, the industry is now facing a rather massive contraction in activity and employment even if Labor is elected nationally. Sticking to the Coalition government’s current policy of reducing carbon dioxide emissions to 26 per cent below 2005 levels would slam the brakes on the sector. On GEM’s figures, the amount of new renewable energy capacity required each year to achieve a 50 per cent target is around 1,850 megawatts. 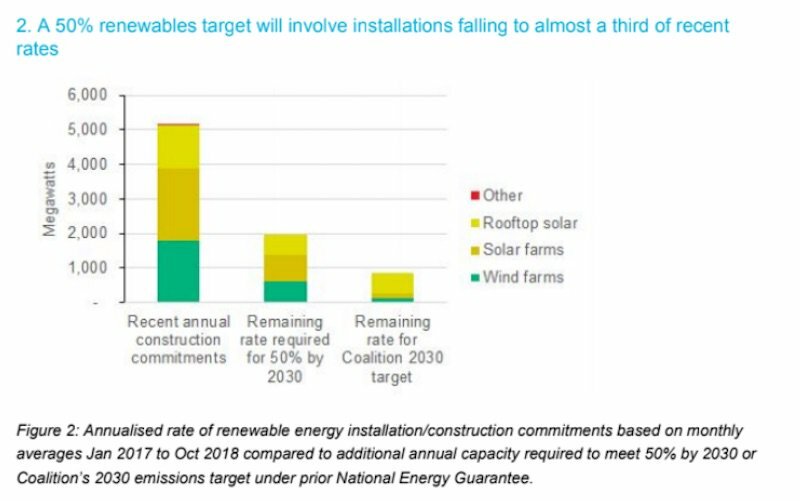 “The Coalition’s 2030 emissions target, as embodied within the proposed National Energy Guarantee, would involve a collapse to 839 megawatts per year,” Mr Edis said. GEM’s quarterly Renewable Energy Index found October had been a record month for rooftop solar with Australian homes and businesses installing more than 150 megawatts of capacity for the first time. The report noted the amount of rooftop solar installed so far this year has already passed last year’s total and now stands at 1,243 megawatts. “This exceeds the Liddell coal power station’s average capacity over last summer’s peak period,” GEM said. As renewables — with their low cost base — make gas and black coal less competitive, pushing them out of National Electricity Market’s generation auction, prices received by generators will tumble and margins will be crushed. “The amount of solar capacity we’re on track to have operational by 2021 will mean competitive conditions in the wholesale market between around 10am to 3pm will be akin to what we tend to experience late at night between 2am and 5am even if you take Liddell out,” Mr Edis said. 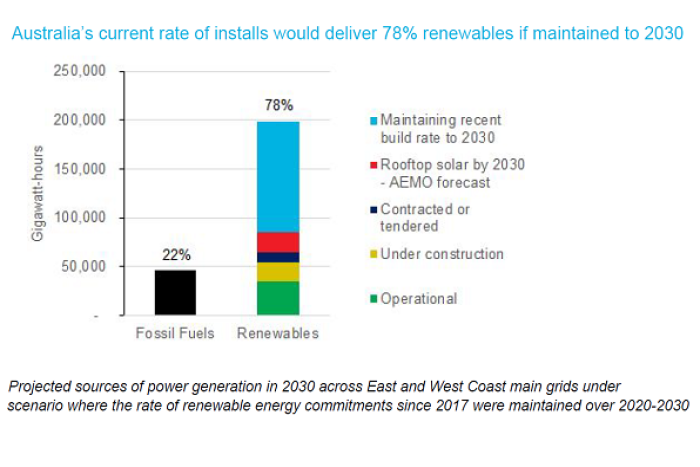 “That suggests very low power prices set by the marginal cost of black coal generators — roughly $35-to-$40 per megawatt hour —which are likely to be below the levels required to make a solar farm financially viable,” Mr Edis predicted. Those low prices, when it is windy or sunny, will put pressure on Clean Energy Finance Corporation’s ability to lend, which is required by law to exercise financial diligence with its investments. “Without a revenue top-up via the NEG, the CEFC may judge that further finance to renewables projects is inconsistent with its objectives to obtain a financial return at or above the government bond rate,” Mr Edis said. I can’t vouch for the figures, and Edis is a bit of a booster, but there is no doubt that the renewables boom is real and big. Federal government hopes for a significant cut to power prices that it could take to an election have been dashed, with Australia’s major “gentailers” mostly raising or holding prices steady. Gentailers – which own generation and electricity retailing businesses – said they had been forced to absorb rising wholesale energy prices, network charges and “green” scheme costs that subsidise the installation of rooftop solar. Eastern states newcomer Alinta Energy led the way with a 1.9 per cent increase for electricity charges and 7.1 per cent for gas. The driver? The local gas price has risen from a range of $8-9Gj over 2018 to $10-11Gj in recent months. Until the gas cartel is smashed, nothing else matters for power prices. Yeh sure. Even have idiots protesting at wind farms. We have 2% population growth so our population doubles every 36 years and they talk about carbon reduction?? Hang on a minute, you need to keep it stupid by not introducing topics unrelated to the simplistic narrative or the media won’t be able to construct a sound bite. Population growth is unrelated to quality of life and sustainability – just ask The Greens. They’ve got it all worked out. There is no limit to the number of people you can cram into Australia and this has no impact upon energy demand or quality of life – just ask Dr Liz Allen. All of our agricultural mechanisation and supply chain will be powered by renewables by 2030; just keep repeating the comforting narrative and don’t worry about the details. Liz doesn’t. And don’t worry about things like the 300 trillion BTU is used by the aluminium industry in the USA alone. That’s about 800 billion kw/h. Give total energy consumption in Australia is about 223 billion kw/h (roughly a quarter) it gives some indication that energy consumption is highly dependent upon the industries we support. Sustainability will only be possible if we move away from heavy industry and rely upon other nations to do things like aluminium electrolysis. We’ll send them the raw material and they can fire up the coal generators and we’ll buy it back. At the same time we will become Big Australia with a big demand for the products of dirty industries. How will we pay for it is anyone’s guess once we are not making anything of value. It appears that most don’t have the slightest idea about how far our politicians (LNP, ALP and Greens) have sold us down the river. Oh for goodness sake Clive!!!! This is easily achievable – self-fulfilling in fact. There will be no ‘economy’ – so no worries mate! Too right – just say Yes we can & 80% as a mantra and it will come true! Actually if they allowed Tasmania to dam the Gordon below Franklin – Victoria would have halfs it’s renewable target and Tasmania a 100%. This is how Norway has 90% of the target covered – Hydro and then has excess gas & oil to sell to the world; finally (think logically) what about the animals caught in the valley’s? Well they have time to move up the valley as it fills and if you believe in CC, then aren’t sea levels going to rise anyways? You know it makes sense! R2M for crying out loud, “Alcoa already looking to use solar in the smelting of aluminum” its a bloody taxpayer funded research project, things like that can take decades to go from study to commercial implementation, nowhere in the article you posted mentions “Alcoa is adopting solar in the smelting of aluminum”. Lets shift what remains of Australia’s heavy manufacturing industry to China and Indonesia. Then we can go 100% renewable agricultural economy. Solar to produce aluminium? Do you realise how much constant power supply is required? Not to mention that a power cut sets the aluminium in the smelter pots and it takes ages if at all to get the smelter operational? Solar has its place with batteries but the big light in the sky goes out once a day … constant base load power required for desal and industry … how to cover that? t the big light in the sky goes out once a day … constant base load power required for desal and industry … how to cover that? Don’t take the bait here, fellas. R2M is a troll of note and utterly clueless to boot. If we had net zero immigration after Snowy Hydro was built, we could have been powered by renewable energy. The need for battery storage is now much more urgent. As PV generation arcs up (pun intended) there will be electricity going begging from 11 am to 4 pm which could be captured for later use. Batteries can be Li-ion, Flow, pumped hydro or yes, even heat storage in molten salt of graphite blocks. First, there is no such thing as renewable energy, the mass amounts of solar panel waste and non-recyclable lithium batteries is an environmental disaster that will dwarf coal. Clean coal is the future along with Gas powered electricity. (un)renewables = less power generation = higher energy costs. I’m all for less pollution but we need to do this properly, without the bs scare mongering by money makers and people with stars in there eyes like Musk who on the one hand crows to the masses about saving the planet but then launches rocket ships that expunge tonnes of plant killing, carcinogenic waste across it’s flight path, hypocritical at best. Definitely correct. Not even taking into consideration the waste generated by the solar panels and batteries, the solar panels and batteries are made in huge factories and I’m pretty sure those factories aren’t all running on renewables. Solar and storage and their problems aside, as far as I’m concerned the future is not necessarily renewable, but decentralised, electricity generation, and that’s possible right now, and it has been enabled by the “renewable” electricity generation technology advancements as a result of the global warming movement, coupled with the debt-induced gouging of the centralised generators and distributors that has brought down the relative cost of switching over. It’s akin to the viability of the processing of shale oil and oil sands, compared to extracting conventional oil, as the price of conventional oil increases. Conventional electricity has priced themselves out and its simply become a matter of when people are brave enough to switch over and go off grid en masse. The writing was on the wall as soon as the reins were handed over to the private sector. Then the debt exacerbated the rate of their gouging. And global warming spurred on the research into making traditionally expensive renewable generation cheaper. While everything you say is correct, you’ve missed the point. The point of the global warning drive, or any agenda, ie black lives matter, cyclist, feminism etc is to drive the left wing Cultural Marxism belief into the minds of the sheeple that allows them to willingly accept the loss of freedom for perceived safety, all the while capturing a larger base of consumers by encouraging mass migration from poor over populated nations into countries like Australia. The only winners are the Harvey Norman’s of the world. Hence the ensuing of children with pitchforks in the streets after just having their brains dry cleaned by ideological teachers. non-recyclable lithium batteries is an environmental disaster that will dwarf coal. Not all battery tech is based on lithium. See link I provide above as just one example. Lots of other types under development as well. Lol, you crack me up. All the world’s climate scientists are Marxists, hahah haaaaaaaa! Pull the other leg. Thanks for the laugh, astroboy. Hey R2M, sure battery tech is wide but Lithium is mass market. I would not be surprised if we don’t see a swing back to combustion engines like the low emission orbital engine over the next decade or so as people wake up. At the moment car companies are chasing coin as they pander to the people wanting electric cars not what may be right (PushBikes), it’s all about the dollar. I stand corrected on the clean coal comment, I should have said Cleaner Coal is the future, and I agree carbon capture is bs. When will people arise from their slumber and see the con that is carbon and realise that the issue is pollution in general. “all the world’s climate scientists” More BS! Flawsie, which way – your comment does not make sense. No, it’s not a “con”. Carbon dioxide is a GHG and it’s raising the world’s temperature. Pollution is a very secondary issue. Not in my book. Calling fossil fuels “the future”, ignoring things like hydro and Concentrated Solar Thermal with false claims of “no such thing as renewable energy” and having a go at Musk … all that was missing was the “algore” meme. True. I have solar powered lights on my deck at home and they actually make everything darker! Shoulda got the coal ones. Well I see the shills got to this one quickly, must be the Google Email Alerts system. lol shills, im no shill. I work for myself and can see the brainwashing ten miles out. I wonder how many accounts the Minerals Council are funding here? 80% is a doddle. 2030 is too pessimistic. The statistics speak for themselves. We are using as much electricity as we did back in 2006, and prices have never been higher. Electricity companies never more profitable. If anyone needs any more encouragement to go off grid, then I don’t know what else it would take. Supply and demand is broken by greed and gouging of an essential resource for life. The gouging is necessary because of the wages everyone (ie, those who can steal them first!) needs to service the debt they have and/or obtain the debt they need. Intermittentcy is not technical but rather political issue. For a fraction of money we waste on pointless things in just couple of years we could have enough seawater pump storage to run the country for weeks. Just couple of smallish reservoirs (1-2sqkm 20-30m deep) on high cliffs near the coast would provide enough storage to supply electricity for weeks. The cost would be fraction of any existing battery systems or alternatives like nuclear (even with the highest environmental measures like double waterproof walls and double embankment) and would last 100 years with not much maintenance. So from my solar micro inverter install, April to late October is marginal due to tree shading and not very effective at all on cloudy days. Even from Nov to End of march on a cloudy day and no tree shading it’s -ve on those days wrt to not drawing from the grid. Can VIC for example really achieve the targets as coal is turned off. It’s why I think I’m going to need a battery, and I’ve got a 3.2KVA inverter gen set just in case. Over the past two years we’ve had plenty of transformers blowing as the number of high rise apartments keep getting built so with hotter summers I’ve spent money to keep the house/business running. What do you think it has dropped your Power Bills by afund? Since March it’s generated 4.7 MWh’s and now I’m with another retailer it looks like it will be better as I only paid $10 for the last 60 days. I think the highest was $90 with the other lot. From now until March 2019 it should really work well assuming not too much cloud. I think it’s a 6 year payback roughly, but it might be less once I have a full years data. If I had no tree shade it would be working way better. strange that the article says Labor would ‘slam on the brakes’ since they ‘only’ want 50% by 2030. Wouldnt the 50% be a minimum commitment not a maximum? Given the existing commitment is lower still, i dont see the gripe. Well said! Maybe a few have stars in their eyes but I think it is mostly power and not of the electrical kind. Of course, completely offset by what’s actually happening in the market on a day to day basis in Qld. That is why electric powered buses beats light rail on many fronts. Faster and cheaper to build. Renewables just aren’t manly enough for me to get onboard with. There’s something primal about burning sh1t that I will never ever give up no matter how much the ponces try and make us soft with [email protected] sh1t like wind. I don’t consider the guy with a commerce degree to be a reliable source on renewables, considering his CV. Now if he had studied Electrical Engineering instead of that super hard Commerce degree then I might take notice. For instance all his talk around installed solar capacity vs coal fired … yeah but solar needs batteries to cover after dark power usage. Not to mention solar cell performance varying with temperature. Nice thing about coal is that it just works consistently, useful for all night power needs eg industry hospitals desal lighting etc. Now yes coal should be a declining part of the mix into the future but the Green ideology to kill it is daft. 24/7 molten salt CSP for all applications that must have constant power. Well the headline is pure fantasy, that even your own supplied graphs imply is highly unlikely.